Join 100 Hearts with your monthly gift of $12.50, or annual gift of $150. 100 “Hearts” donors sponsor an apartment for an entire year. 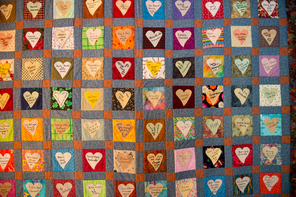 As a 100 Hearts donor, your name will be placed on a heart that is sewn into a quilt of 100 Hearts and hung in your sponsored apartment. Guests who stay know you care! Have an even greater impact with a monthly gift of $25 or $50, or an annual gift of $500 or $1,000.